BAPA’s Beverly/Morgan Park/Mount Greenwood Memorial Day Parade steps off following the Ridge Run on Mon., May 27, with Tim Noonan, founder of the Chicago Council of Gold Star Mothers (CCGSM), leading the parade as Grand Marshal. The Road Home Program Center for Veterans and their Families at Rush University Medical Center is the parade presenting sponsor. The oldest community Memorial Day parade in Chicago features military vehicles, a color guard, scout troops, historical figures, floats, vehicles, flags, music and the Jesse White Tumblers. Area families, businesses, institutions, groups and others are invited to march to honor the men and women who have given their lives in the U.S. armed services to protect our freedom as Americans. Noonan formed CCSGM with the mission of restoring and preserving a forgotten monument erected nearly a century ago to honor Chicagoans who gave their lives serving in World War I. Gold Star Mothers have lost a son or daughter in military service. Noonan’s tireless efforts have led to the restoration of that monument, now in a place of honor in the Dan Ryan Woods. Before they merged with the American Gold Star Mothers in the 1920s, the original Chicago Council of Gold Star Mothers had erected the stone memorial in the new Dan Ryan Woods Forest Preserve at the then peaceful southeast corner of what is now the busy intersection of 87th and Western. Over the decades that monument became hidden by overgrowth and fell into extreme disrepair. A few years ago, it was rediscovered by volunteers working in the woods. Noonan feels deeply that monuments constructed to honor U.S. military heros need to be preserved. The forgotten monument discovered just blocks from his North Beverly home inspired him to take action. With the help of American Gold Star Mother Modie Lavin and architectural historian Dan O’Brien, Noonan organized the not-for-profit CCGSM and began his quest to have the memorial restored and moved to a location near the Dan Ryan Woods visitor center. He called a community meeting and saw that other neighbors supported the importance of saving the memorial. Encouraged, Noonan stepped up to lead the campaign. A solemn process began with a formal decommissioning and careful removal of the monument to storage. Noonan and the CCGSM team researched how to replicate the missing original bronze plaque and rebuild the monument using century old materials and techniques. Although there is information about similar monuments erected shortly after WWI by Chicago’s Gold Star Mothers groups, almost none exists for the local memorial. Noonan and CCGSM members have put in countless hours working on the restoration effort as well as raising funds to cover the costs. They are also raising awareness about the importance of maintaining and visiting memorials that honor the people in our armed services who gave their lives for our country. The monument restoration came to the attention of Cook County Commissioner John Daley who helped in the effort. The Forest Preserves District of Cook County deconstructed and stored the original monument, then later built the new concrete footing. The CCGSM was awarded a grant from the Landmarks Illinois WWI monument preservation program and also received donations from interested people and parties. With the goal of having the restored monument installed by Nov. 11, 2018, the 100th anniversary of the armistice that ended WWI, the CCCSM relied on what Noonan called “blind faith” to get the project completed. They ordered a new bronze plaque from a Chicago manufacturer who, according to Noonan, used the same techniques employed on the long lost original plaque. With the help of a Chicago Marine, the CCGSM were connected to the International Union of Bricklayers and Allied Craftworkers who guided the hands of apprentice masons in rebuilding the monument, also using century-old techniques, with the original stones supplemented by local stones collected by Noonan. 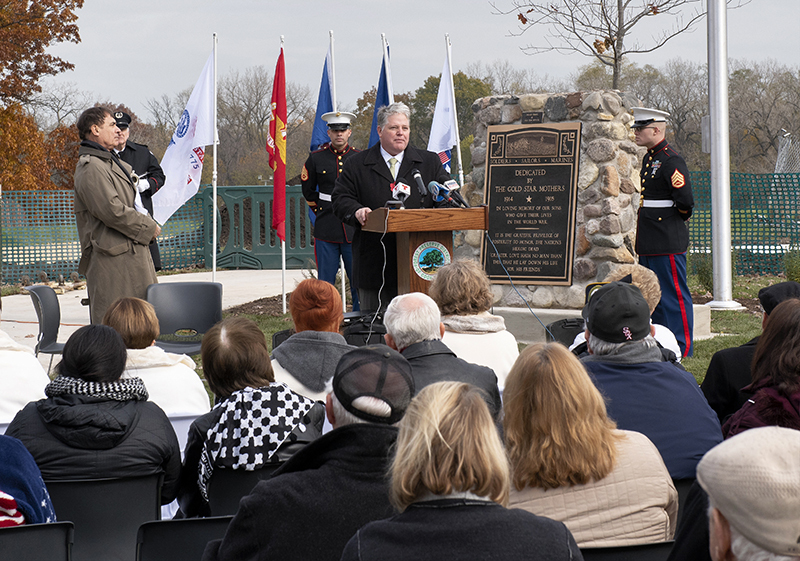 On Nov. 8, 2018, just three days before the Armistice Day centennial anniversary, the Chicago Council of Gold Star Mothers WWI memorial was dedicated at the Dan Ryan Woods. Set in a wooded location very near the highest elevation in Chicago, people who visit the memorial are treated to a vista that stretches all the way to downtown, putting into perspective how the efforts of a small band of volunteers in Beverly/Morgan Park honors the never-to-be-forgotten sacrifice made by soldiers from throughout our city. The CCGSM continues to raise funds to cover the costs of the restored memorial, and the costs of preserving the memorial as well as adding benches and amenities for visitors. For more information about the history behind the monument, the restoration effort and how you can make a donation, visit Chicago Council of Gold Star Mothers on Facebook. The program is committed to helping veterans returning home to address service and combat-related health and mental health issues as well as family challenges. Services are provided regardless of ability to pay. Beverly/Morgan Park neighbor Modie Lavin is the Community Outreach Coordinator; call her at 312-942-8354. Groups interested in marching in the parade can sign up on the Ridge Run page or call BAPA, 773-233-3100.